I am a classic introvert in an extroverts world. I work for a church and serve with another church. Introvert and extrovert are just labels but they are labels best used here to explain my mental state. When I say I am an introvert, I don't mean I am anti-social. I simply mean I don't get my energy from groups of people or social interaction. I love one on one time with people but I wear out pretty fast when in group situations for long periods of time. I have been feeling fairly disconnected lately from the people I care about. Some of it was my own doing. I had unconsciously backed away from things but some of it was circumstances which made it harder to connect with those people. Nothing dramatic or bad just life creating situations where it meant we had to be more intentional. Anyway, realizing that I was starting to be just that...more intentional. The lack of connection was making me bitter, sad and alone and that needed to stop. But in true Kim fashion, life quickly got out of control. I had gone from not doing much to do doing alot in a short amount of time. Added to that work and church life was picking with the start of the new year causing me to have more on my plate. NONE of which I was complaining about. I was actually loving it. But before I knew it I was worn out. The odd part was I wasn't unhappy or depressed or sad but emotionally I was beginning to feel more fragile. I couldn't figure out why all of sudden I wanted to cry. I was enjoying myself but my emotions had another plan. I was physically and emotionally tired. That kind of tired where every part of you aches. You just want to close your eyes. So this weekend, like every weekend this past month, was packed full of things. Sunday, I reached my bowling point. I woke up early Sunday to get ready for a morning of work but one thing after another kept going wrong. In the grand scheme of things each of these were very very minor but built over the morning on a tired, probably hormonal female, I lost it. I woke up to a script for our announcements and a time change that meant mentally I needed to be prepared which normally is fine but not this morning. Then I was late leaving because I was waiting on a file I would need for the service. Then missing my train, I waited 25 minutes for another train making me 20 minutes late for work. As I was preparing the 42 cup percolator, I realized a key piece was missing making the machine unusable which meant I had to quickly call in a Starbucks order, knowing it would take them 45 minutes. As I left I asked my best friend to cut bagels for me since I was then going to be running around. While I was gone, she sliced open her finger. When I left to get the coffee I was teetering on the verge of an emotional breakdown but the time alone was allowing me to calm down a little. As I walked back into the school I saw my friend sitting there and walked over to her where she told me she cut her finger. As I looked down to the bloody mess that was her finger I lost it. Tears came out without the slightest bit of control. My best friend was sitting there consoling me and she had the cut hand. This reality made me even more upset. I was losing it 1) at work 2) in public and 3) for something that wasn't happening to me but to her. The anger at myself made the tears come more freely in sobs. I couldn't gain my composure so I was forced to ashamedly text my boss to tell him I couldn't do my part in the service. I felt humiliated and stupid for having to tell him I couldn't do it for the reasons listed above :/. My boss is pretty cool and totally understood but still I felt humiliated. I don't back out of things easily. My sense of obligation is too high in me to ever do that but I couldn't stop crying and he didn't need that mess up there in front of 200 people. I'd love to say that we came home and chilled out the rest of the day but alas, I had other things I had to do but the rest of the day was filled with less emotional outbursts and more fellowship with people I love which seemed to help. Knowing that Mondays are an off day for me helped get me through the day. I can't say that things are a mess in my life and that was what lead to my breakdown. It really was exhaustion. My ability to process what is happening around me is next to nonexistent when I am tired. Its the first thing to go and is usually a sign that i need to slow down. My issue lies in that i don't want to slow down, I am enjoying myself but I guess my body disagrees. Its so funny to me how differently we are all made. How we adjust and react to life and situations. We often want people to react emotionally the same way we do but yet we all have different perspectives, different values, and different personalities. Times like these help to remind me that we all are different and require different things from the people around us. We bring different things to the table which is what makes a great community. Celebrating and honoring those differences should be more of what we strive for instead of forcing each other into the same box. oh no! i am so sorry. i know how that goes though, as i have many introverted friends that need down time, personal time, and no contact very often. 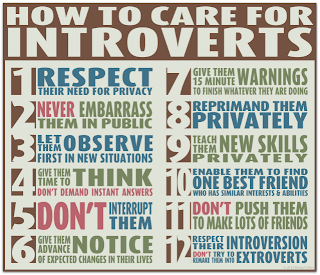 you've got to make a point to institute it as introverts are usually also perfectionists that don't want to let others down.